Florida may be the theme park capital of the world, but it also has so much to offer by the way of day trips from Florida. Forget about fighting the crowds at Disney Land and Universal Studios. Instead, go on an adventure with one of the popular Florida days trips that locals recommend. Hire a car from Miami Airport and you’ll have the freedom to visit beaches, forests and other attractions that only locals know about. Here’s our list of the top five Florida day trips. Florida has hundreds of freshwater springs and Ginnie Springs is definitely one of the state’s best. Relax at Ginnie Springs and swim in the clear, blue waters. It’s also a popular spot for kayakers, snorkelers, open-water divers and cave divers. It has an intricate and extensive limestone cave system and many turtles and wading birds. The nature park is open year-round and entry incurs a small fee. Jumping aboard an airboat at Everglades National Park is a quintessential Florida experience. There are many airboat tours that will take you across swampy grasslands so you can see wildlife. Don’t be surprised if some alligators pop up to the surface! It’s both a thrilling adventure as well as an educational experience about one of Florida’s most interesting natural ecosystems. Siesta Key Beach is consistently ranked as one of the best beaches in the world. It has some of the finest quartz sand in the country and it stays cool on a hot summer’s day. Not to mention the pristine turquoise waters and the natural coastline. You could easily spend days or weeks soaking up the sun in this perfect location. But if a single day is all you have time for, then Siesta Key Beach makes for one of the easiest and most enjoyable Florida day trips. The Kennedy Space Centre in Titusvlle is the famous site where you can learn all about NASA and get up close to the space shuttle Atlantis. If you time it right, you can even witness a real rocket launch! 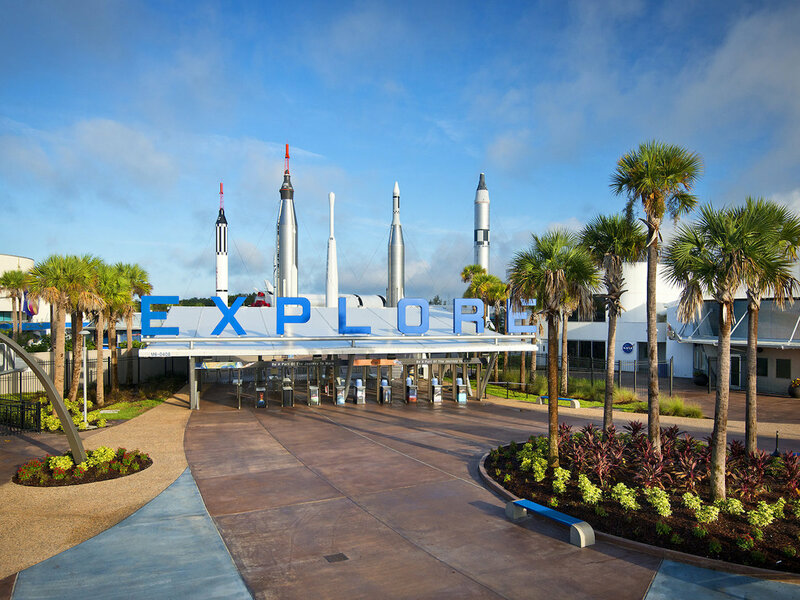 The Kennedy Space Centre is known for its interactive experiences. You can even have lunch with a real astronaut and hear captivating stories about space travel. It’s bound to be a once in-a-lifetime experience. St Augustine is America’s oldest city, making it the perfect day trip destination for history lovers. Walk the walls of the 500-year-old city’s Castillo de San Marcos, which the Spanish constructed in 1672. Centuries-old battles were fought here. You can watch an engaging historical re-enactment or even a cannon firing. While in St Augustine, you must also explore the cobblestone streets, historic landmarks and the quaint cafes.